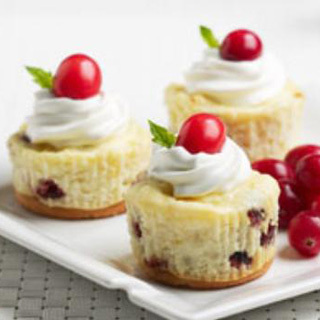 These mini cheesecakes, featuring tart cranberries, are the perfect petite dessert for fall. Preheat oven to 325 degrees. Line a muffin tin with 12 foil liners. In a medium mixing bowl, combine cream cheese, sugar, eggs, vanilla and lemon zest. Use a hand mixer to blend well. Stir in dried cranberries. Fill each liner ¾ full with cheesecake batter. Top each cake with a fresh cranberry, if desired. These cheesecakes freeze well, so you can make them ahead of time. Just allow them to thaw at room temperature for 2-3 hours before serving.